The Promax System is a gas boiler designed and manufactured by Potterton. 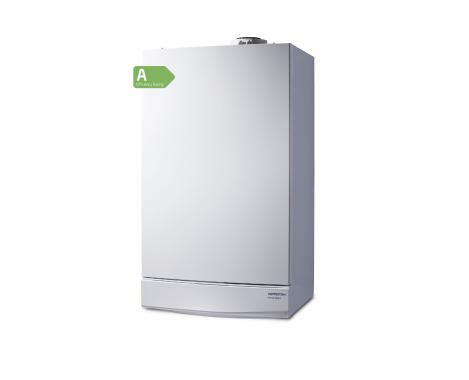 It is a condensing wall mounted boiler that comes with a wide range of features and options to make it one of the most dependable boilers on the market. One such feature it boasts is a pre-plumbing jig to help you save time on installation and cut the cost down! With it also coming with flueing options of up to 20m it offers flexibility in where the boiler is able to be placed. It is designed for those homes that have high water demands but this unit is perfect for almost every sized home with it being available in outputs of 12kW, 15kW, 18kW, 24kW and 32kW. This Promax System has a 24kW output and it has an efficiency rating of 89% making it a B rated boiler. It has a nox class of 5. This range also features a fully modulating single box solution and it is developed with robust hydraulic connections. The range offers reliability and quality as standard, with this unit also being compatible with the Megaflo Eco solar cylinder and Santon Premier Plus solar cylinder, this unit comes with 2 years warranty as standard so you can be sure you have bought a reliable boiler.